i-Go is an electric bike concept loaded with futuristic rider-friendly features such as regenerative wireless brakes, internal gears, smartphone charging ability, mobile app and GPS all integrated into a foldable design. The i-Go ebike rental system was designed by recent college grad Marc Andre Cardinal, and it may be the best bike share scheme we’ve seen to date. Bike sharing is no longer a new concept. Following Copenhagen’s lead, successful bike share programs have been introduced into major urban centers such as London, Paris, Barcelona, and Washington DC. 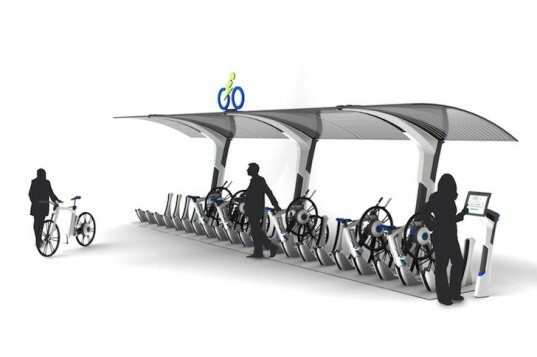 Electric bike sharing systems, however, are still a handlebar on the horizon. So far, one eBike sharing concept has come to term in the Lithuanian capital Vilnius and another in the Swiss city of Nyon. As batteries become cheaper, lighter and more portable, it may not be long before more bike sharing cities incorporate electric designs into their growing fleets. This could be an especially good thing for cities with a challenging landscape (or those with lazier populations). An aluminum structure would hold the batteries and electronic components, while recycled plastics would make the rest of the body. Plastic is a choice material because it is durable, doesn’t rust, hides scratches and is light weight. Of course, that still leaves the cost of electronics and maintenance, but with riders generating power and transporting themselves from A to B to C with zero-emissions, the system would create net-positive energy meaning less power demanded from the grid, less cars on the road, and a healthier environment for all to enjoy. It may not be too long before we see this concept scaled up and it’s definitely something to get excited about. An alluring, powerful, high-tech design coming from a recent college grad (who’s currently looking for employment) bodes well for the future of sustainable transportation. If your city is considering saddling up and joining this new wave of collaborative consumption, you might want to mention what you saw here. Stumbling onto this article some 2.5 years after it was posted, I'm struck with how beautiful this concept ebike looks. I do agree with Robert that the projected cost per unit mentioned in the article is hopelessly optimistic, but I can't fault the esthetics of the design or write the whole thing off as "industrial design masquerading as engineering. My thoughts are if this design were actually to be utilized in a bikeshare program is that many would simply "disappear" since it's such a looker (most purpose-built bikeshare bikes have a dorky look to them, no doubt to discourage theft.) So many concept bikes/ebikes I come across (not to mention more than a few that have actually been built and even marketed) look truly hideous and appear to be avant-garde design studies from people who have never actually ridden. I'd beef up the super-skinny handlebars on this one and make a few other minor changes, but this is one I'd actually like to see get beyond the drawing board. This is industrial design masquerading as engineering. If you look at current bikes with this level of technology, you will see that they cost in the $3500-$5000 range, which is too expensive for bike share systems. Take a look at the "slippage" in the Vélib system in Paris. It's expensive, even at a cost of about $800 per bike. 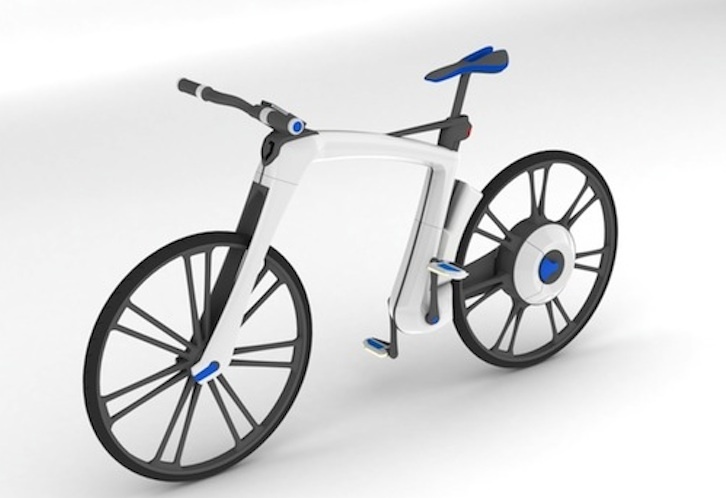 i-Go is an electric bike concept loaded with futuristic rider-friendly features such as regenerative wireless brakes, internal gears, smartphone charging ability, mobile app and GPS all integrated into a foldable design. The i-Go ebike rental system was designed by recent college grad Marc Andre Cardinal, and it may be the best bike share scheme we've seen to date.